Growing up, their mixed heritage made them feel like outsiders. Now, they're building community with art. When Shannon Elliott was seven years old, she came home from school singing a rhyme she'd picked up on the playground. You might have screeched it again (and again, and again) on the schoolyard, yourself. Or maybe you remember the hand motions that all the kids would do — pulling at their eyes while chanting: "Chinese, Japanese, dirty knees, look at these." "I didn't get it until she said that." Elliott's mom is fifth-generation Chinese-Canadian; her dad's family is English. "I always knew that I looked different from everybody at school," says Elliott, 28, who grew up in North Vancouver. But in that moment, she says, "it was my first time feeling like an outsider amongst the other children. I got it, for the first time, that this is something you're always going to feel. [...] It's a really bad feeling." What she didn't know back then is that she isn't alone. 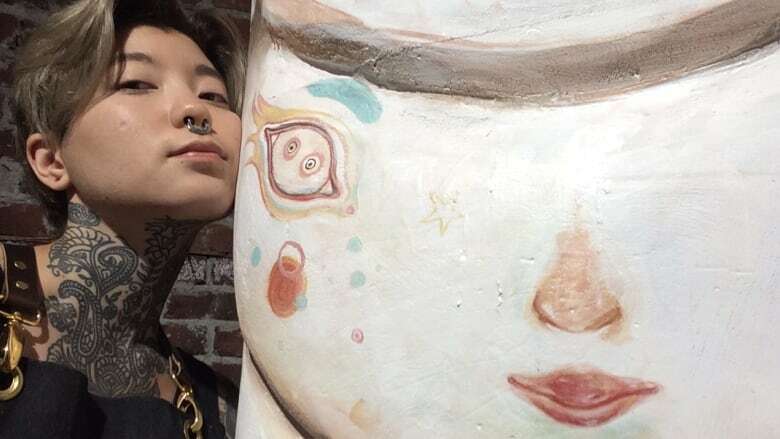 Until August 22, Vancouver's Untitled (Art Space) hosts a collection of original work by Elliott, Nomi Chi, Katie So, Mandy Tsung and Lauren YS — artists who share a mixed East-Asian ancestry. It's called Dirty Knees — you know, like that rhyme we were talking about — and as Elliott puts it, "it's a show exploring the heritage of a group of people that probably doesn't speak out a lot — but it's a huge group of people in Vancouver, in Canada." The goal, says curator Nomi Chi, is to spark conversation. "I think I've been trying to have these conversations for most of my life," says Chi, 27. Born in Toronto, but raised in Vancouver, she's a recent graduate of the Emily Carr University of Art and Design. "I often feel as though I do not have a home, or rather, more like I do not have an origin," Chi explains. When you're mixed, she says, "just about every external system or person treats you as though you're an outsider," and, she explains, you don't feel like you fully fit in with the communities of your heritage, either. By doing the show, they're hoping to build a sense of belonging for people who have struggled with their own sense of identity. "I'm hoping that people — especially half-Asian people — will realize we all have similar experiences in our childhood. We're all kind of family," says Elliott. "I really want people to come together […] and realize they're not alone." In real life, the artists provide that support system for each other. Chi, Elliott, So and Tsung all met through the Vancouver art scene. 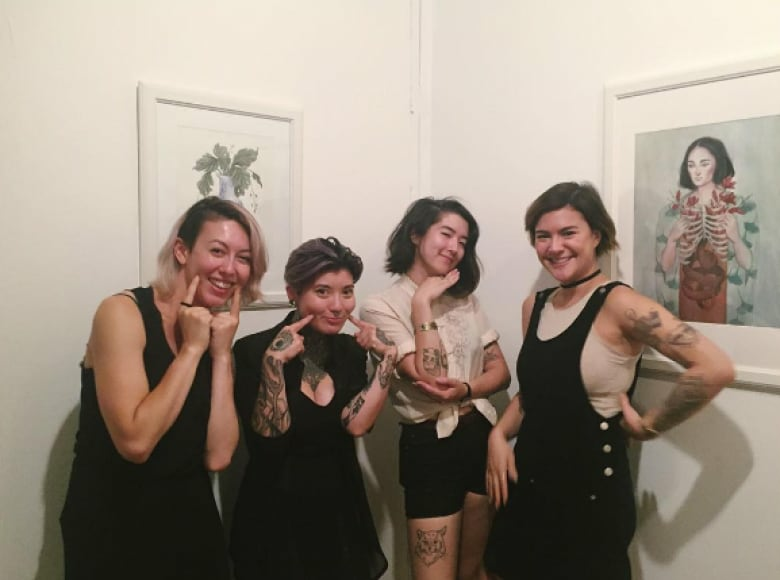 "[It] can be a pretty tiny community," says Chi of the art world — and the fact they're all working tattoo artists makes that community even smaller. "Nomi gave me one of my first tattoos," Elliott laughs. Lauren YS, a California artist known around the world for her murals, is the one exception, but she's a good "internet-friend," says Chi. Shared childhood memories are something Elliott says they constantly talk about as a group. And the more "funny, sad, funny-sad" stories they shared with each other on social media, the more Chi realized they had something. "[I] thought it could be an exciting foundation for an exhibition." Chi says she asked everyone to approach the project from a personal angle. "There weren't any parameters," she explains, but she says, "I encouraged us to focus on the topic of our racial makeup and personal experiences." The works range from paintings to comics to sculpture, and they're all figurative in nature — vibrant and easily relatable. "Illustration is a powerful visual art medium," says Chi. "It has the potential to take complex ideas and communicate them to a wide audience." That audience includes the artists themselves. Elliott talks about how powerful it feels to see your own experience represented — and how visitors to the gallery have been coming up to her, talking about how the work gives them flashes of "me, too!" "Katie [So] did a series of comics that I think are the most accurate at describing the half-Asian experience," says Elliott. "The pieces have a lot of tension and awkwardness, which is a translation of how being biracial can feel. I wanted to explain to people how we all have a very individual experience, despite being treated with one assumption or another." Elliott focused on a similar theme. "I think a lot of the pieces I made were on the feeling of being torn," she says of her four acrylic paintings. As a painter, she says, her style is typically "classical European" — a total break from the black-and-white work she does as a tattoo artist day to day. "I tried to pair that with some traditional Chinese imagery — the flatter colours, the blue-and-white pottery." Lauren YS ran with the show's goal of building community. She launched a "small survey" on Facebook in June — asking people who identify as half-Asian to contact her if they wanted to contribute (and maybe be drawn). As she wrote on Instagram last week, there were "way too many submissions to draw" — but a video of her time-lapse sketches is being projected as part of the Dirty Knees exhibition. At the show's opening party last weekend, Chi says guests were coming up to her, thanking her for doing the show – for telling stories that felt like their own. Stories like the day they came home from school singing "Dirty Knees."